pearl onions | Crappy Kitchen - Good Dinners! Succulent Short Ribs on the Christmas Table (serves 10-12) Super Easy to make! I know that most households have a big Juicy Turkey on their table on Christmas day but I confess I have never adorned the center of my table with it. My mother never liked Turkey and even thought she always cooked one, the feeling of her not being excited over it rubbed off on me. She grew up on a farm and had an aversion to poultry because she had to kill and butcher so many chickens as a young girl, which in turn led to her aversion to cooking it for her family. Turkey was her least favorite and I think when I ate it at Christmastime I could taste that bad memory of her childhood. Turkey does make an appearance on my table each year but it is always some version of a stuffed and roasted turkey breast. This year I stuffed it with a savory sausage and it was very delicious, however the star of the table was the short ribs braised in a robust flavored red wine. I must admit that I don’t cook red meat as often as fish or chicken (I’m not too fond of the beef industry so I only buy when I can afford organic, grass-fed free range meat. Also, we seem to prefer a “lighter” less complex protein on a daily basis). However, on special days, as in December 25th, the feast demands a richness and decadence that makes the meal stand out above all other days in the year. The unctuous short ribs I cooked was the stand-out dish this year, and as far as my son was concerned was the only thing that needed to grace the table. 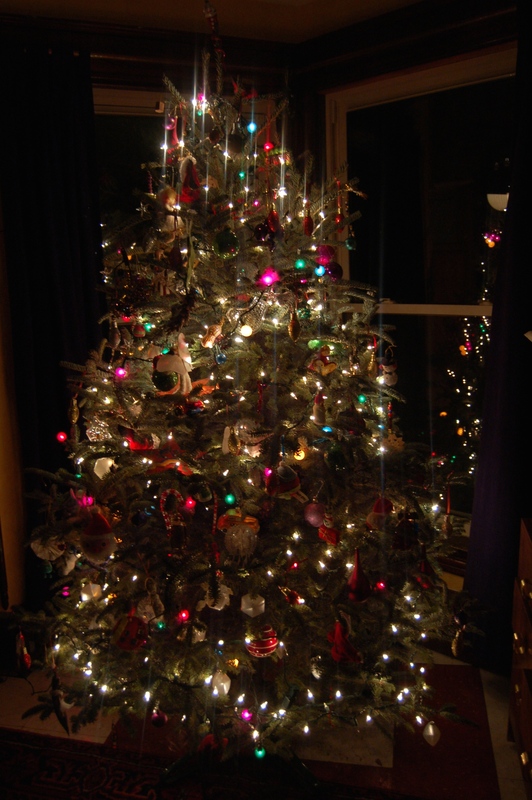 Our tree with its mish-mash of every single ornament we have collected over the years that absolutely must find a place somewhere! They are not particularly Christmassy, so you can make them any time there is a need for something overtly extravagant! 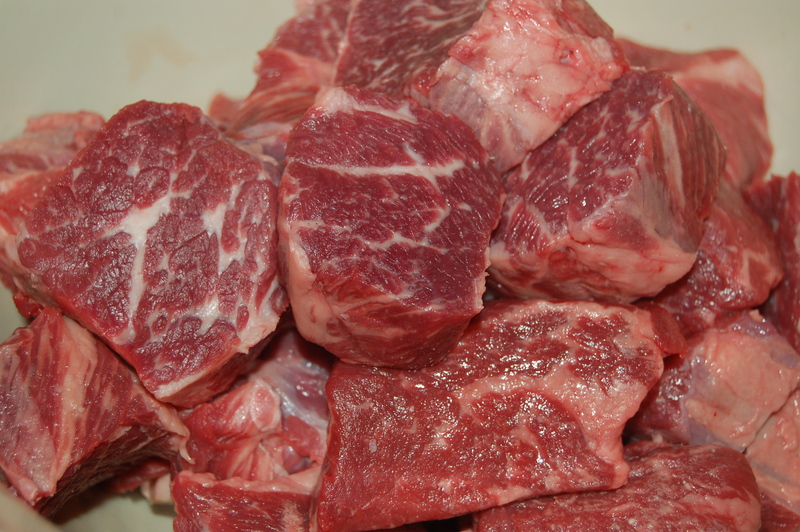 1 – Cut meat and dry it with paper towels and place in a large bowl or a cookie sheet. 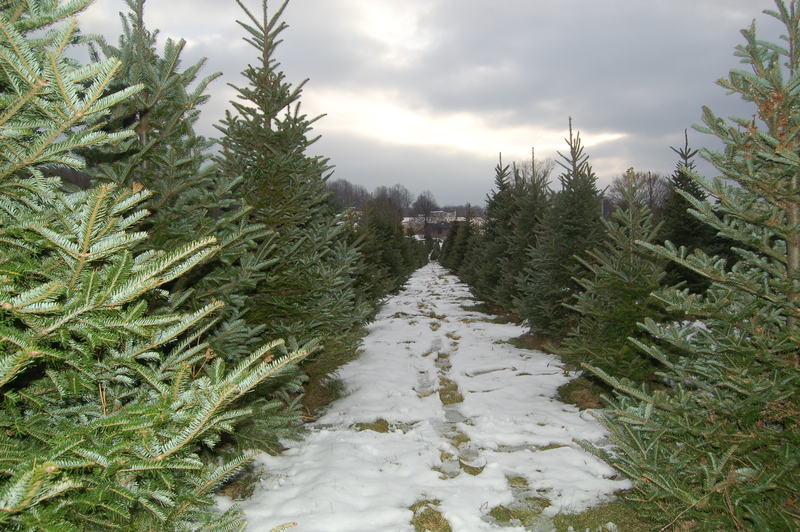 Season well with salt and freshly ground (if you are using a fine ground salt, be careful not to over season). 2 – Using a large saute pan on high heat, sear the meat in batches in olive oil, adding oil as needed. Do not crowd the pan or the meat will not brown nicely. Remove to a heavy casserole as you go. 3 – After the meat is seared, turn the heat down to medium and pour out excess oil. Add the prepared vegetables and saute for about 10 minutes, until beginning to soften. 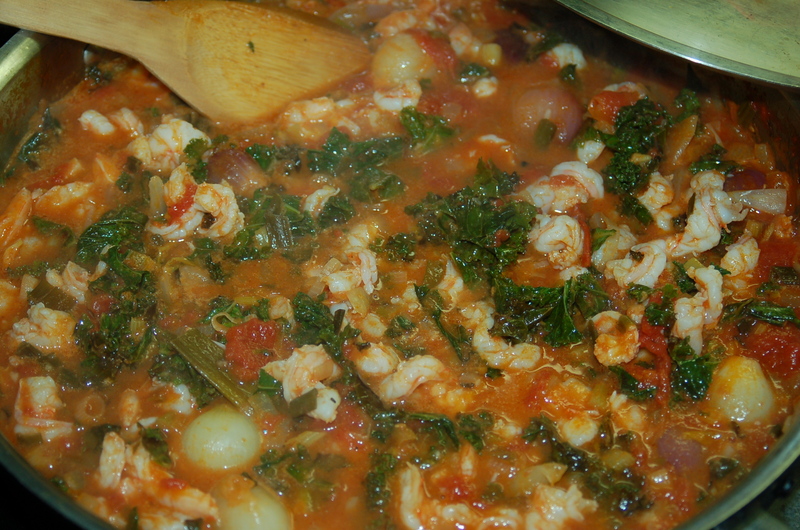 4 – Add the wine and the red sauce and bring to a boil. Pour over the meat (or add the meat back to the saute pan if it is big enough. Cover with a lid and place in the oven for 3 hours. 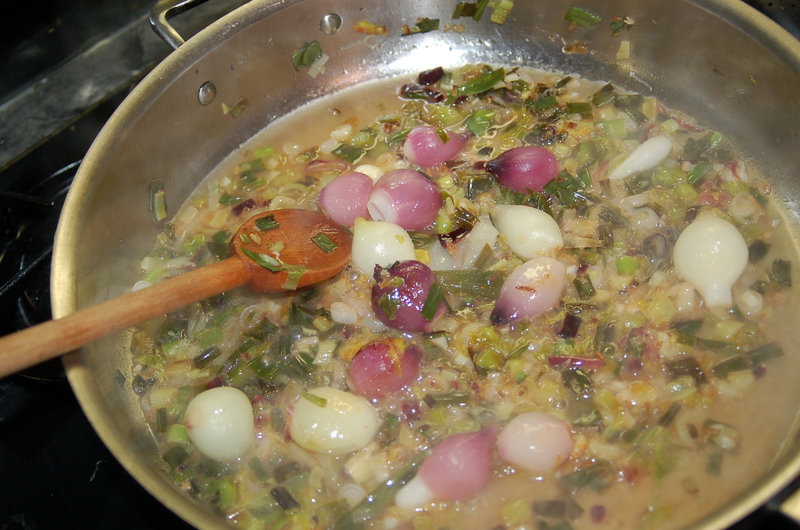 Add the blanched and peeled pearl onions 1 hour before the meat is finished cooking. 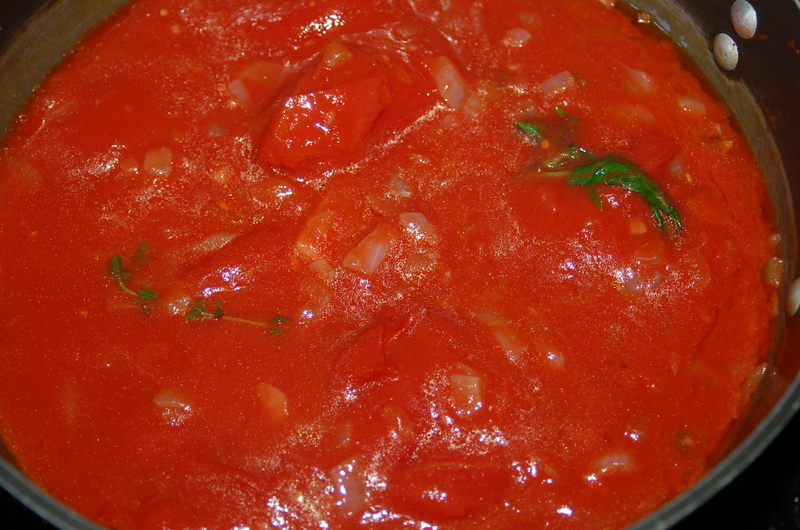 If the sauce is very thick you can thin it out with water until you are satisfied with the consistency. Serve with whatever you like: mashed or roasted potatoes, roasted or sautéed greens beans or a hearty pasta noodle such as rigatoni. (you can do this the day before or while your ribs are in the oven). Put a pot of water on to boil. When it has boiled, add the onions and cook for 4 minutes. Drain and when cool enough to hand or cold, remove the skin. Set aside until ready to add to your dish. 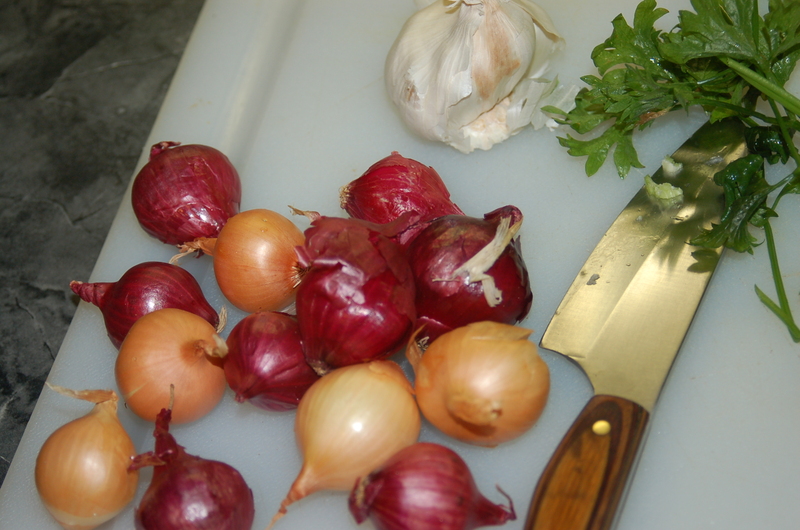 Blanch onions – it is easier to remove the onion skin if you cut the skin in the middle somewhere and then peel it off. This looks yummy, right? Take it from the one who devoured it: yes, more than yummy though, more like scrummdiddly! There are certain ingredients I buy without any notions about what to do with them, or indeed in what dish I should use them, and green beans and pearl onions happen to be in that category. The reason for such purchasing abandon is that both of these vegetables are very hardy and can languish for weeks while I ponder and procrastinate. 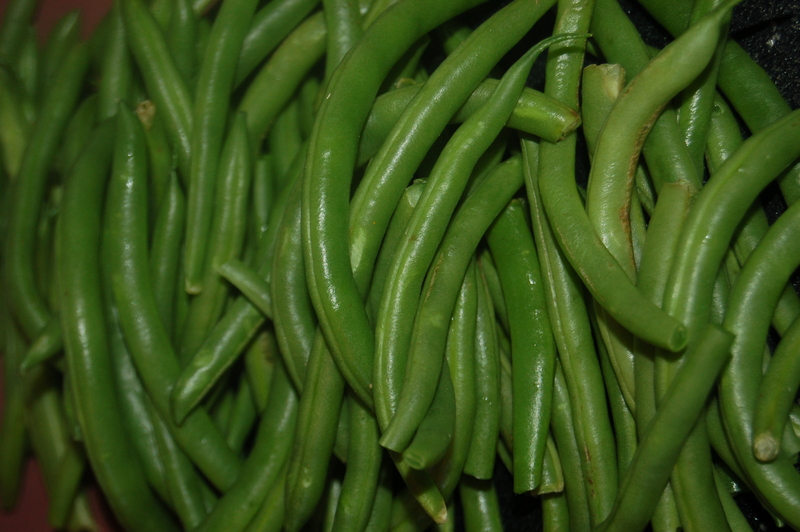 Green beans are the greatest green vegetable around. They can take all sorts of abuse, like long slow cooking with beef or pork, and at the other end of the cooking spectrum, can be quick fried with a little soy sauce and mirin and taste equally delicious. 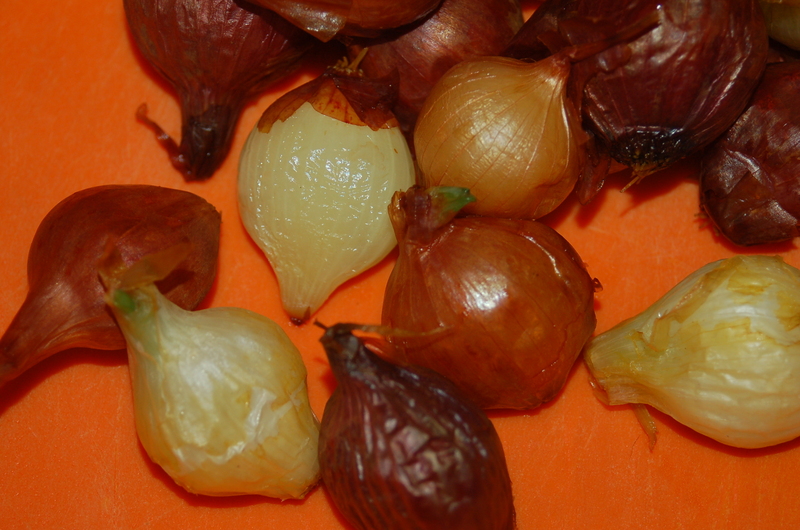 I love these little onions which give a sweetness to any dish they are part of. The only finicky part is getting off their very thin onion skin, which actually puts me off cooking them more often. There is a trick to that problem (blanching them first), but it is still a bit of a pain, and takes more time than I have most evenings. There are other times however when they are worth the trouble, and this was one of those times. I cooked them as part of our Thanksgiving meal last week and am strongly thinking of making them for Christmas too. 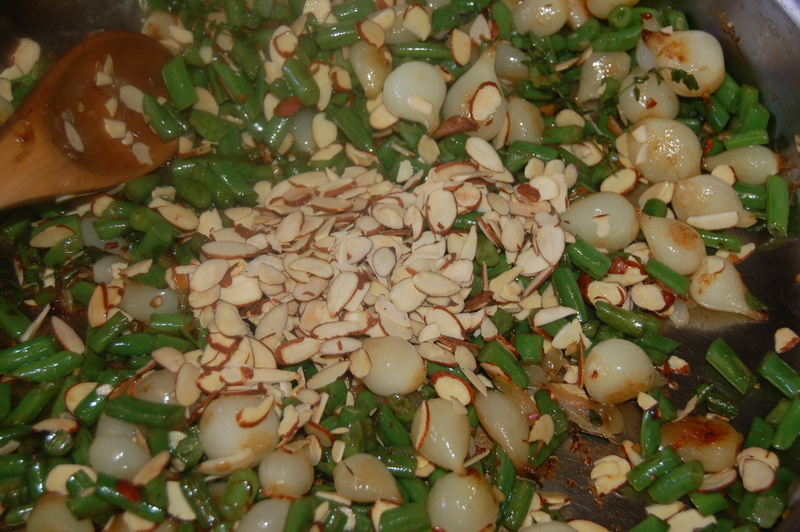 Sauteing beans with little pearl onions, while adding a few more ingredients I happen to have lying around, made this a feast unto itself. 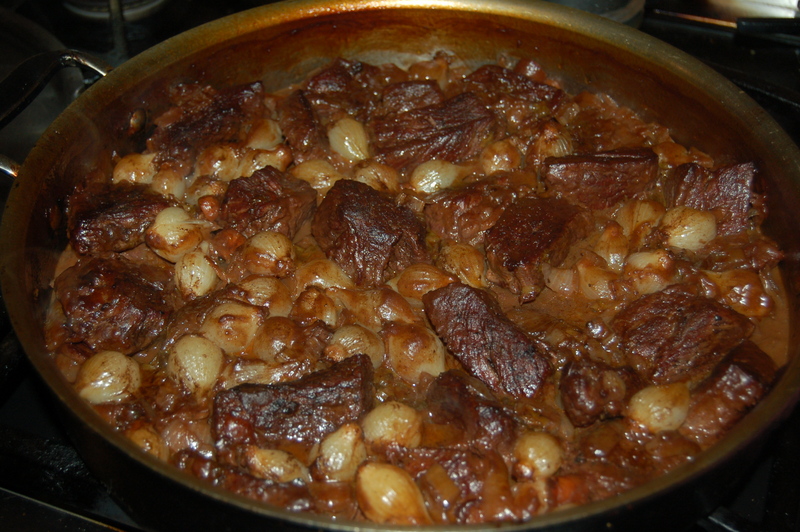 I strongly suggest your arming yourself with onions and beans, and when the humor takes you…make this! 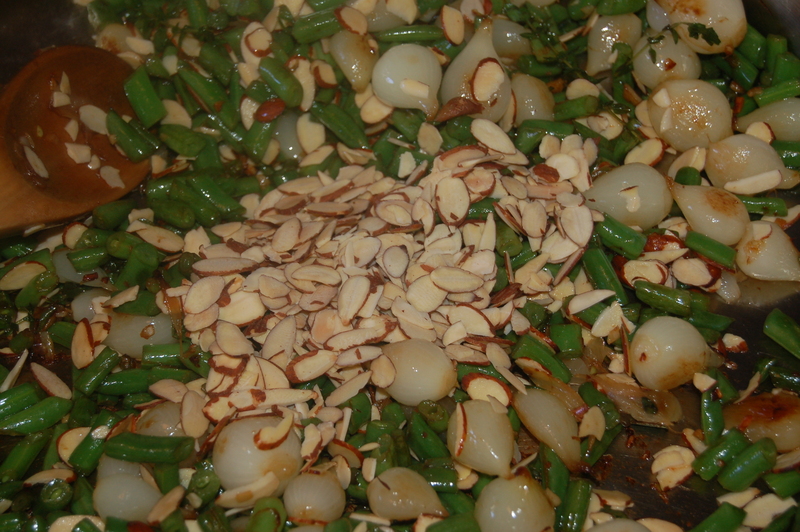 1 – Prep ingredients (chop beans, chop garlic, and gather the rest of the ingredients. Toast almond: Preheat oven to 350* and spread almonds in a single layer on baking sheet. place in oven and cook for 4 minutes, turn and continue to cook for another 4 minutes. Place in bowl to add in dish later. 3 – Put big saute pan on med/ high heat and add oil. 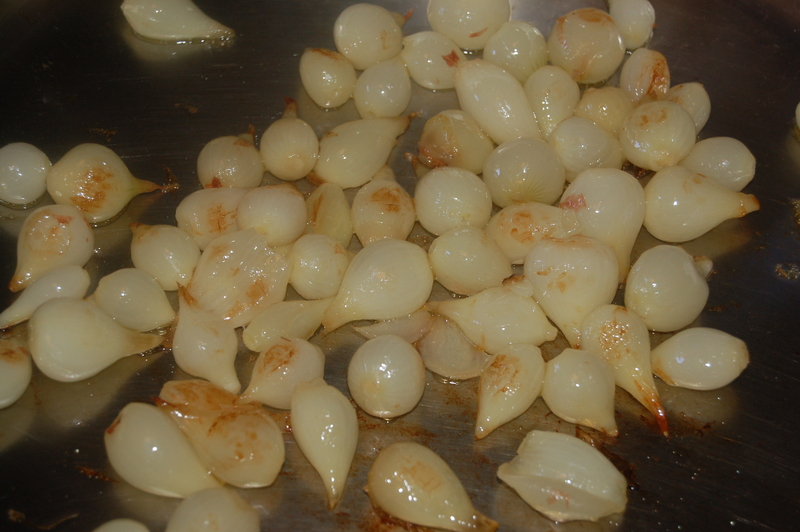 When it is hot, add the onions and cook until starting to get brown spots all over (about 6 to 8 minutes). 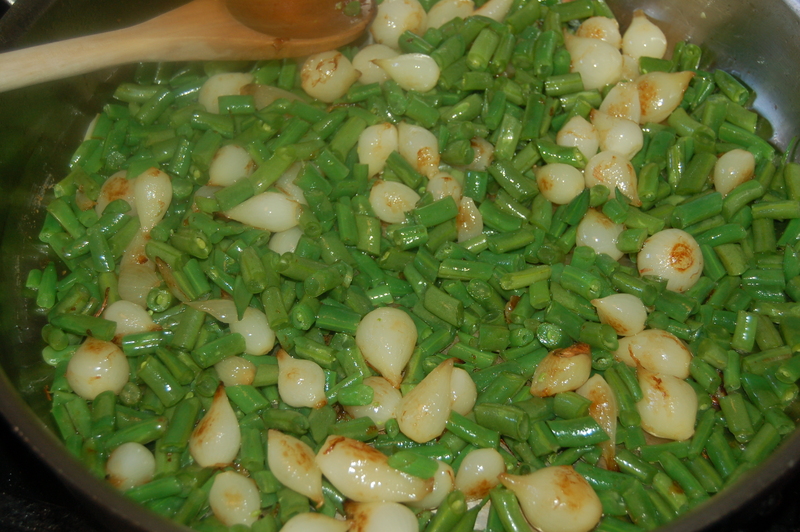 4 – Add the green beans, garlic and thyme sprigs and continue to cook, stirring occasionally. Add more oil if necessary. 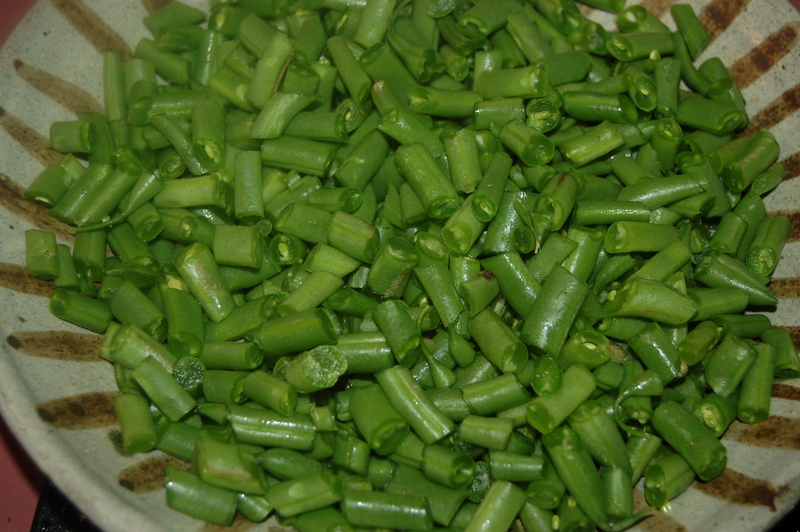 Cook until beans are cooked but still have a bite (pop them in your mouth as you go to test). 5 – Add the salt, several grinds of pepper, cumin and pepper flakes (if using) and stir. Taste and add more of everything if you think it needs it. Finally add the toasted almonds and stir. Serve immediately or cover and keep warm until ready to serve. This can be made hours before and reheated very quickly in the pan right before serving. So, it was 4th of July weekend and since I had 3 free days on my hands, I decided to make the 2 1/2 hour drive north of my house to visit my brother and his family. I also decided to cook dinner for the whole group to give my sister-in-law a break from trying to juggle dinner and 14 month old twin girls at the same time! I knew that everyone loved shrimp and it would cook quickly, and, if I made the dish partially at my house, I would then be able to spend some leisurely time in the kitchen chatting and enjoying a glass of wine, instead of burdening myself with having to do everything at once. That is exactly what I did. 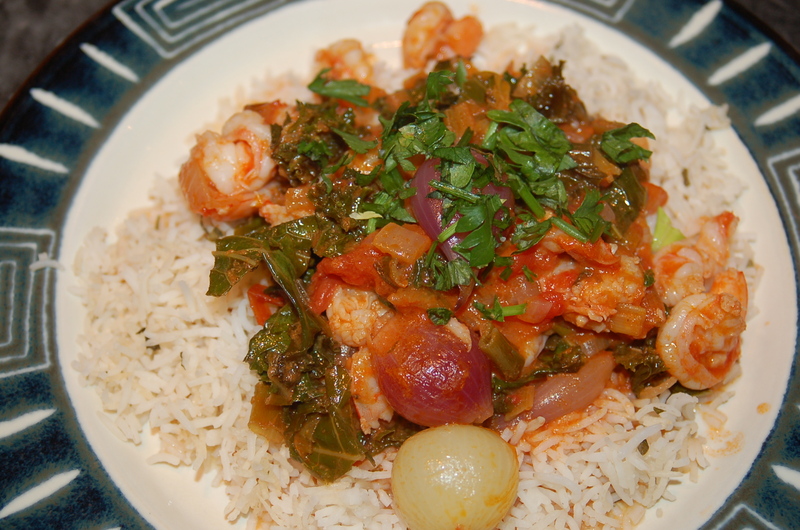 I made a nice long cooked red sauce to add to the shrimp, along with the rice, before I hit the road. When I arrived I headed straight for the kitchen with my cooler, my trusty 13″ All-clad pan and my apron. I had a bottle of wine for my dish and I immediately opened it and poured two hefty glasses for myself and Jennifer. She laughed when I pulled out my camera, and chatted, cooked, drank and took pictures. She of course had been aware of my blog, but had not seen me in action. 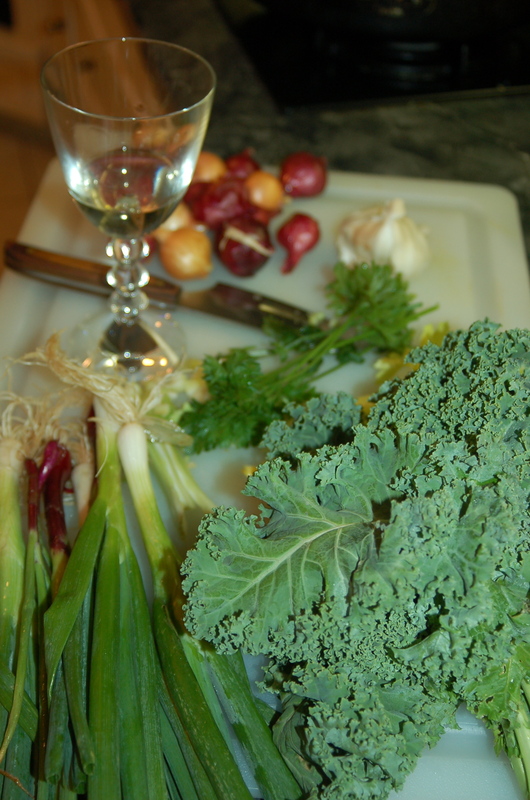 As I took a quick shot of the veggies on her counter-top she dove into the creative process and put my wine glass of wine amidst the greenery! Hmmmm….maybe I need a food stylist! The dish was full of local produce from my CSA box (see top right of my blog for more details) and herbs from my garden. I felt so artisanal! It was great fun making dinner with lots of kids spiralling my feet and my brother hovering, not remotely interested in the process by the way; he was hungry. an expert chopper in training! My son gave a hand by chopping the parsley garnish into a neat pile of wispy greens, while my daughter spent her time picking up her little golden-locked cousins and declaring how cute they were at every turn. The dinner was extremely delicious, and even thought he would never admit to it, my brother Pascal had thirds, which he ate while standing at the pan, not suspecting that anyone was looking! 1 – Heat a pan over medium heat and add oil. Add onions and garlic and saute for about 10 minutes. 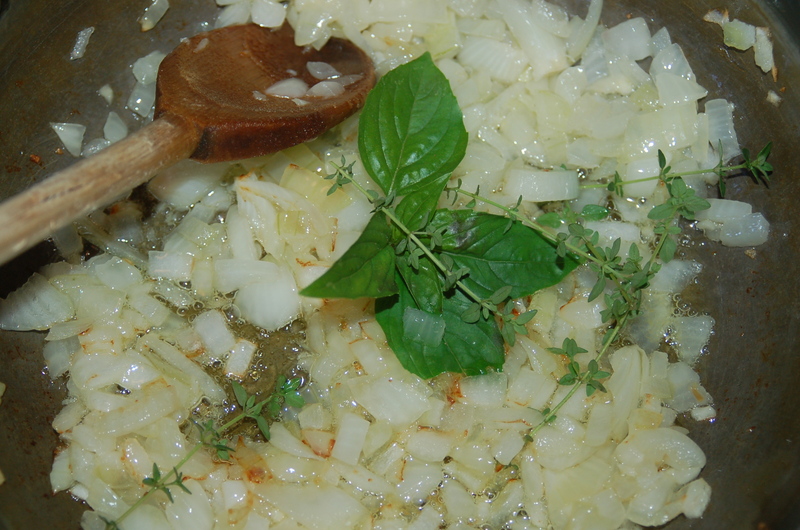 Add the herbs and continue to cook for another minute or two. 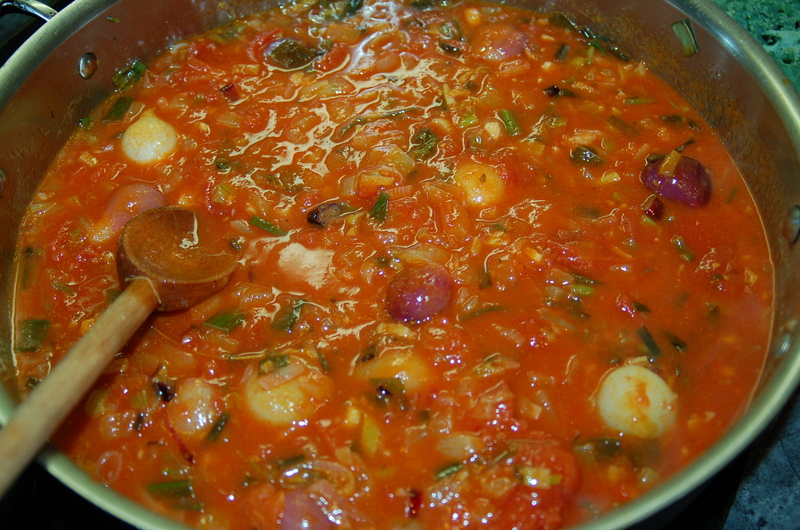 2 – Add the tomatoes and their juices, and a 1/2 tsp coarse sea salt. Bring liquid to a simmer. 3 – Cover and simmer gently for 40 minutes. Taste and adjust seasoning if necessary. Set aside until ready to add to stew. Note: This is a handy and wonderful sauce for lots of dishes, and can be simply tossed with spaghetti. You will need: 4 cups raw rice if using stove-top method OR 6 cup measures from rice cooker if using a rice-cooker, 1/2 cup chopped mixed herbs (such as Italian parsley, basil, apium, sprig of thyme, oregano, winter savory, tarragon). 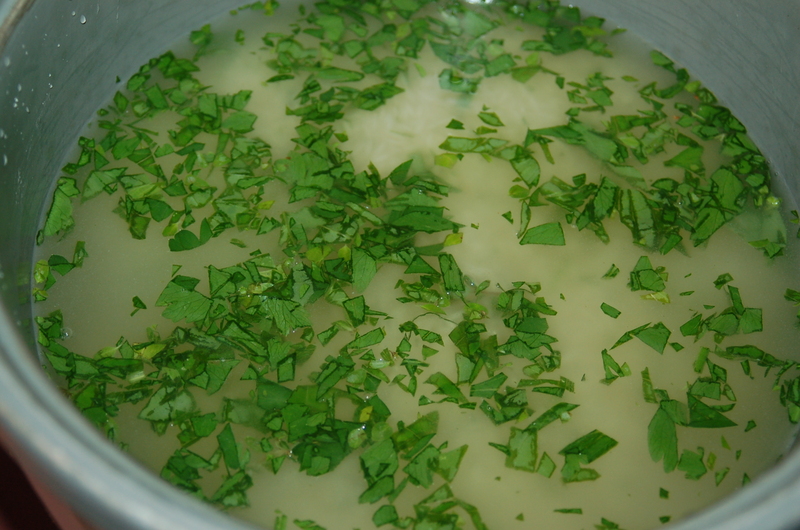 1 – When you have added the water to the rice, toss the herbs into the pot or rice cooked. When rice is cooked, stir herbs into the rice. Don't forget to cook the rice! You will Need: 2 lbs shrimp, deveined, remove shell, (use the 31-40 count per lb size), 2 tbs extra-virgin olive oil, 1/4 tsp cayenne pepper flakes (add up to 1 tsp if you want a tinge of apparent heat), 8 scallions, sliced, (or if you have them; 6 bunching onions from your garden or someone elses’), 2 cloves garlic, chopped, 2 cups pearl onions, (one or more color varieties), 3 inner tender celery ribs with leaves, chopped, 3 cups white wine, rich red sauce (recipe above), 1/3 cup freshly chopped flat-leaf parsley, coarse sea salt, freshly ground black pepper, 8 big kale leaves, center vein removed and finely chopped. 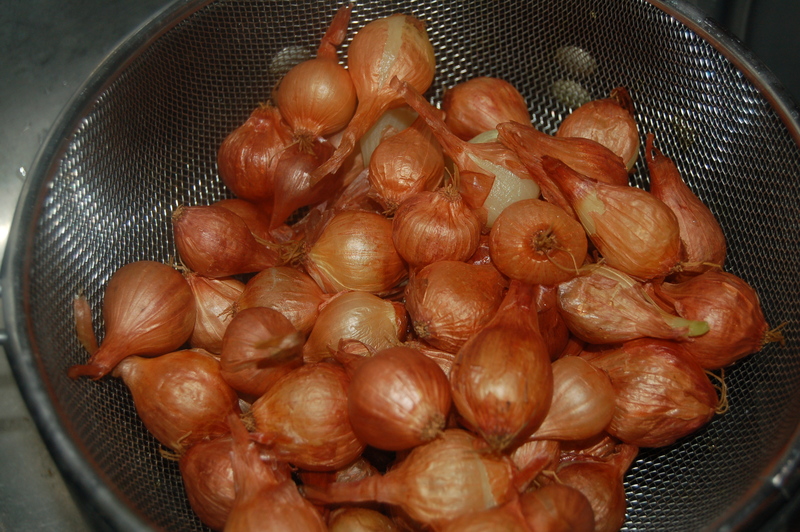 1 – Blanch the onions: Bring pot of water to boil and add onions. time for 4 minutes. drain and when cool enough to handle snip off the long stringy end of the onion and squeeze onion from root end. onion should pop out. you may need to assist it by cutting the skin at the top and peeling it off. Set aside until needed. 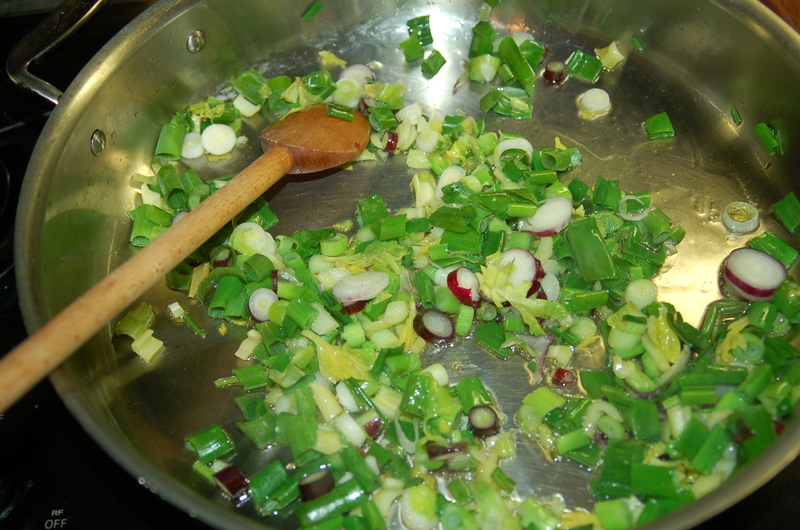 saute garlic, celery & scallions. 2 – Put a big saute pan on low/medium heat and add oil. When it has warmed, add the scallions, celery and garlic. Saute for 8 minutes. 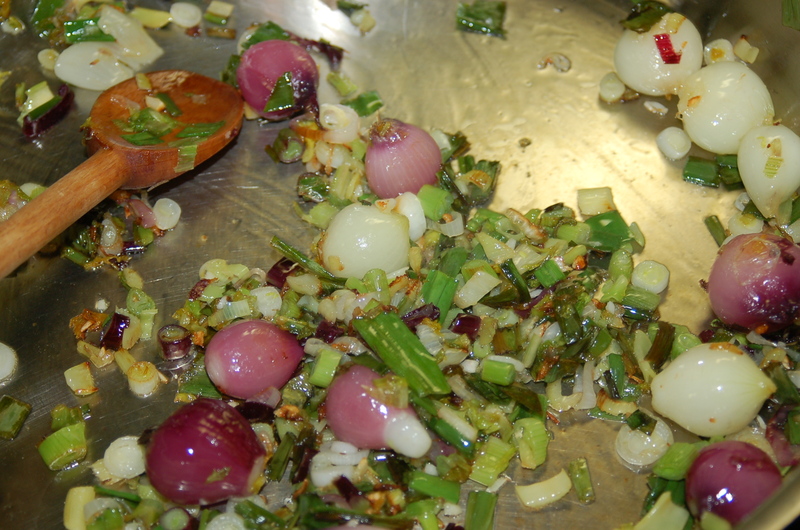 Add the pearl onions and continue to cook for another 8 minutes, stirring occasionally. 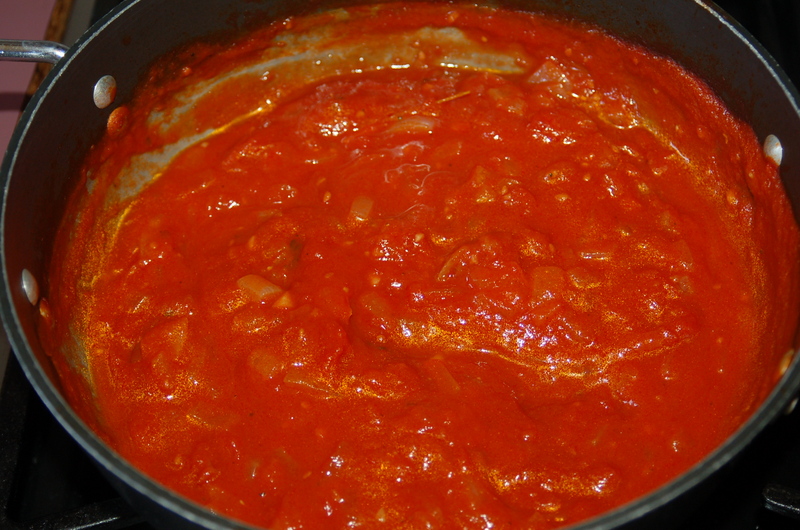 4 – Add the tomato sauce, bring back to a simmer. Cover and cook on low (gently simmer) for 5 or 6 minutes. 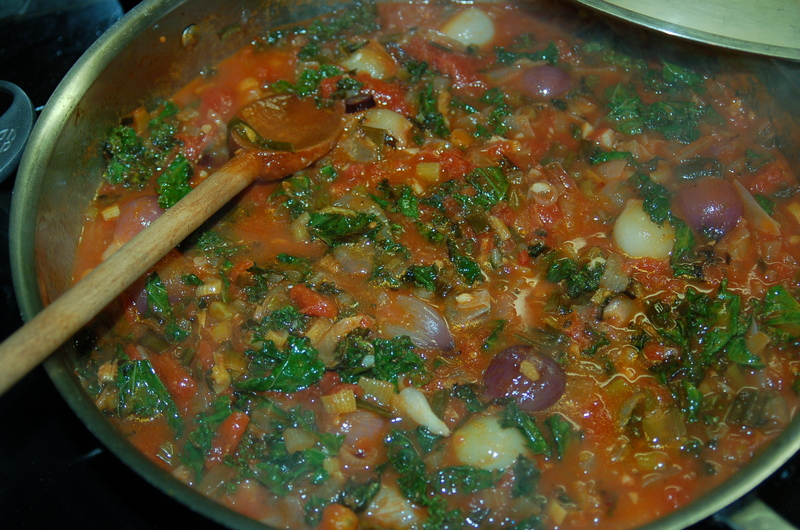 5 – While sauce is cooking, cook your finely chopped kale in pot or saute pan and 2/3 cup water for 5 minutes (time when water is boiling). Drain. Serve on a bed rice and add parsley garnish. Serve with rice and garnish with chopped parsley. This was a divine dinner, again inspired by herbs from my garden, and vegetables from my CSA box (see top right of my blog for more info. on what that means). When what I think of as really Summery herbs start to grow (basil, Italian Parsley, oregano) I tend to forget about the herbs that I use in Winter like thyme for rich lamb dishes, and rosemary for slow-cooked chicken or beef dishes. I was just about to pluck some basil yesterday evening to go with my chicken when I got a whiff of my lovely english thyme, which guards one corner of my herb garden. 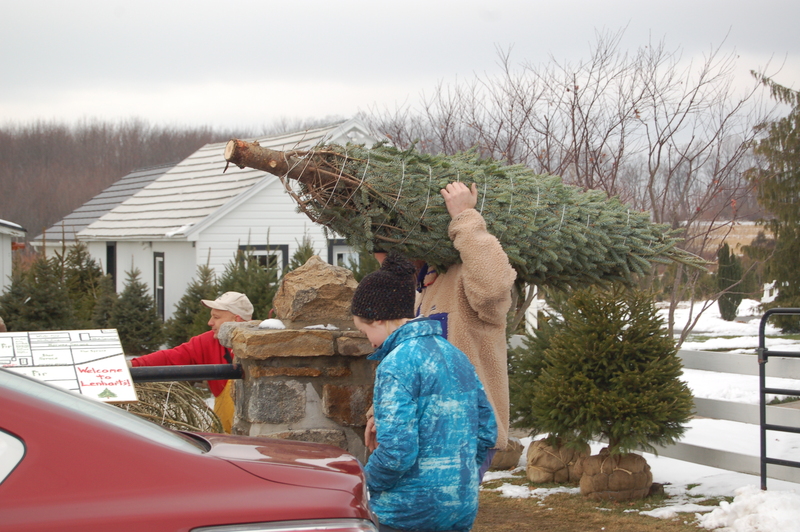 It looked healthy and strong, and I remembered that I had been neglecting to use it! I immediately cut 5 or 6 sprigs and changed how I was going to cook the chicken. Simple, but intense flavors, made this great dinner! I had a sumptuous bag of multi-colored pearl onions and a little bunch of fresh local carrots (again from my CSA box), and I decided on just those three vegetables. I love thyme with carrots, and, onions go with absolutely everything! I really wanted to use my kale but did not want to cook it with the chicken. I instead cooked it on the side, adding a little heat and olive oil to give it it’s own distinct flavor. The pan sauce was delicately sweet, and I would have been quite content to have a bowl of onions swimming in sauce for dinner! 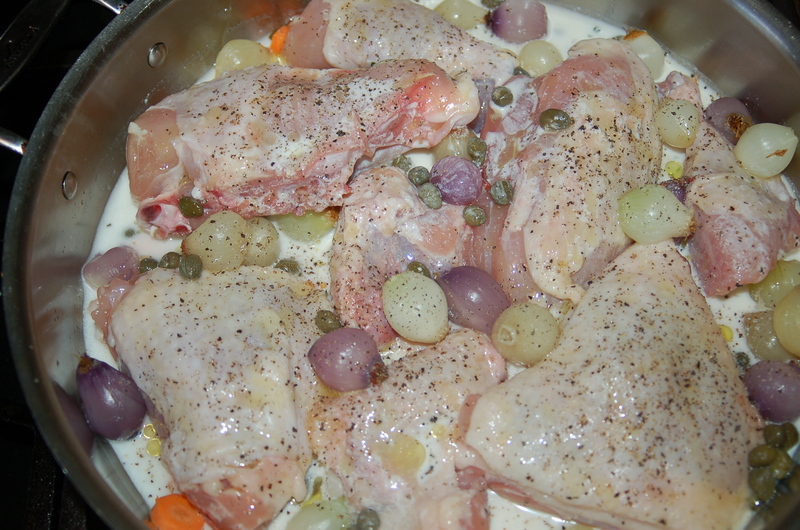 You will need: 1 cut-up chicken, 3 cups of red, yellow & white pearl onions (of course one color will dd also! ), 4 medium carrots, sliced, 5 sprigs fresh thyme, 3 tbs capers, rinsed, (I use Roland brand), 3/4 cup white wine, 1/4 cup heavy cream, 1 1/4 cups water, coarse sea salt (I use Maldon salt flakes), several grinds black pepper, 2 tbs extra-virgin olive oil, 12 -15 kale leaves, inner rib removed (use a knife and cut a V) and chop kale. 1 – First, blanch the onions. Put pot of water on to boil ,and, when it is boiling add onions and time for 3 minutes. Drain, and when cool enough to handle snip the end off where the plant grew out of the ground. 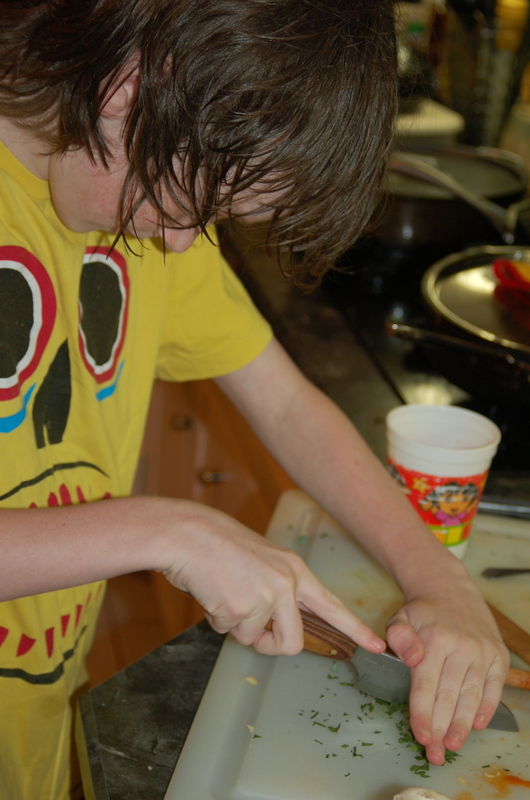 Cut a little of the skin at the top edge with a scissors and peel or pop out the onion. Set aside. 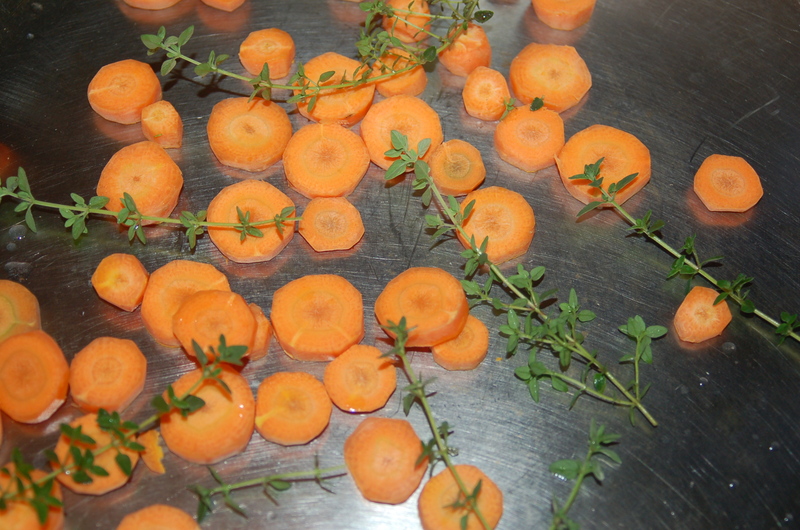 2 – In big saute pan or roasting pan big enough to hold chicken in a single snug layer, add the carrots and thyme. 3 – Next add the chicken. Mix the liquids in a bowl (water, wine, cream) and pour over the chicken. Season the chicken with salt and pepper and tuck the onions around it. 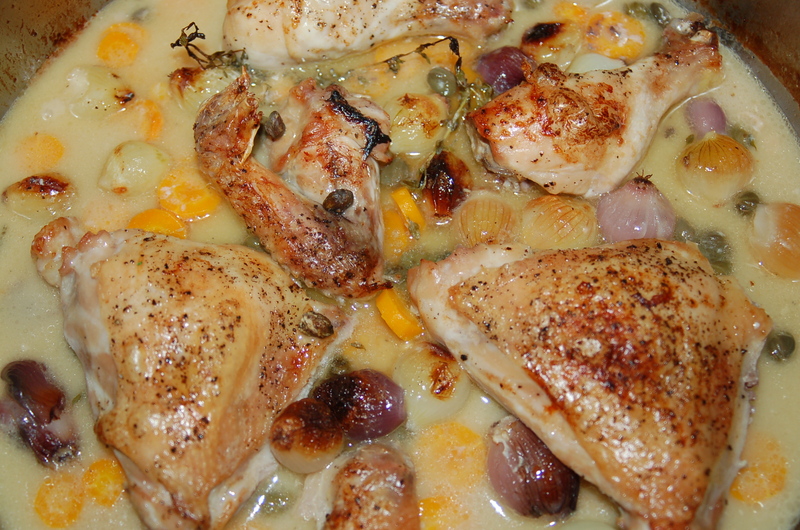 Toss the capers over everything and drizzle 1 tbs extra-virgin olive oil over chicken. Place in the oven for 40 minutes. Take out, remove the breasts to a plate and cover with foil. Return the chicken to the oven for another 12 minutes. Let it sit to rest for 5 minutes before serving. 4 – When chicken has 15 minutes left to cook add a 1/2 cup of water to pan and bring to a simmer. 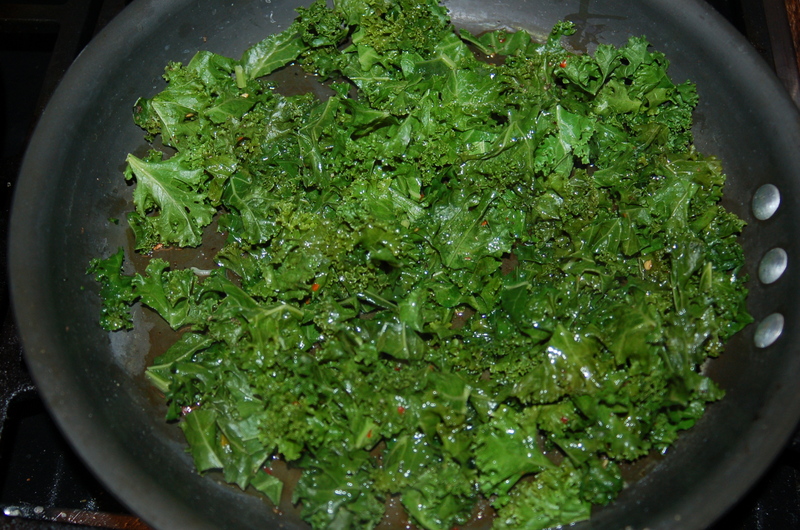 Add kale and a 1/2 tsp cayenne pepper flakes, a sprinkle of salt and pepper and cover. Simmer gently for 10 minutes (add a little more water if you need to). Take lid off and stir and drizzle with 1 tbs extra-virgin olive oil and continue to cook for another 5 minutes. Taste for seasoning. Turn off heat, cover to keep warm. 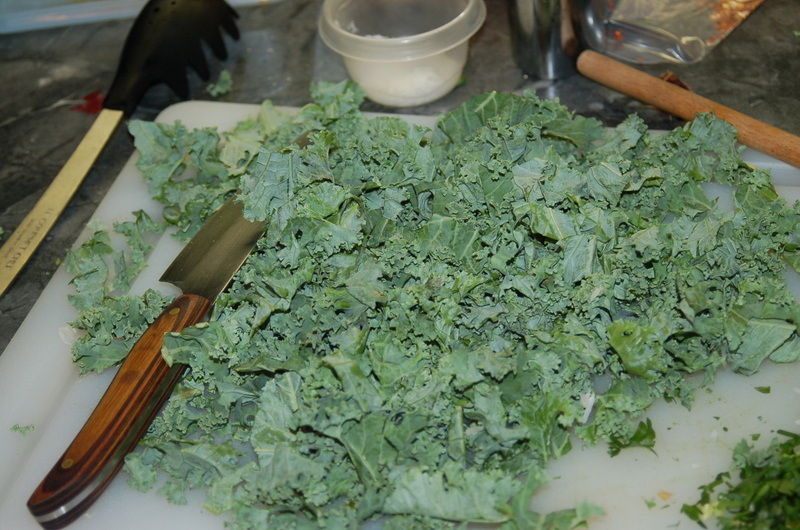 To serve, lay a bed of kale down on a warm plate, top with chicken and spoon some vegetables and pan juices over everything; fit for a king! 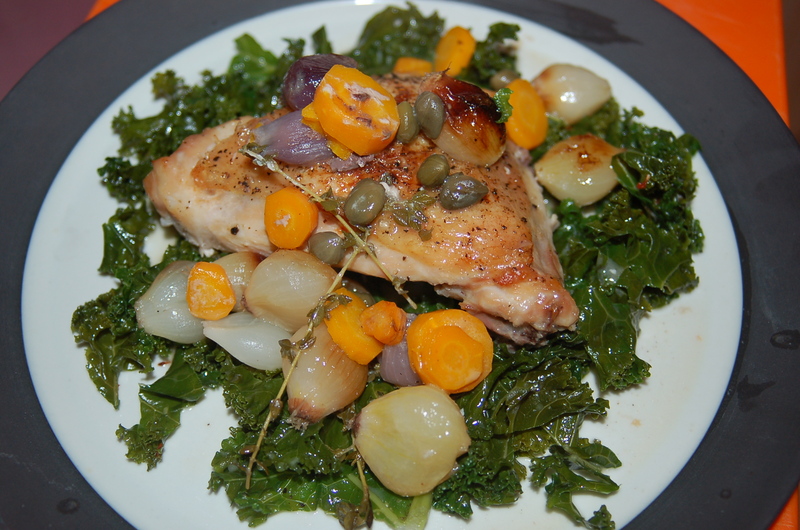 The kale was great with the chicken; earthy and healthy!